Who doesn’t love a little magic over the holidays? If your home is anything like ours, then you also love all things Disney and – more specifically – Mickey Mouse. Even though we’re a Disney-loving family, we like to keep our Mickey Mouse love subtle and unique. If we were comparing it to a computer desktop, I’d say we’re the type to have a single picture on the screen rather than multiple tiled all over the place. So when I was checking out Macy’s Holiday Gift Guide recently and discovered the Coach Mickey Mouse bags, I was over the moon! 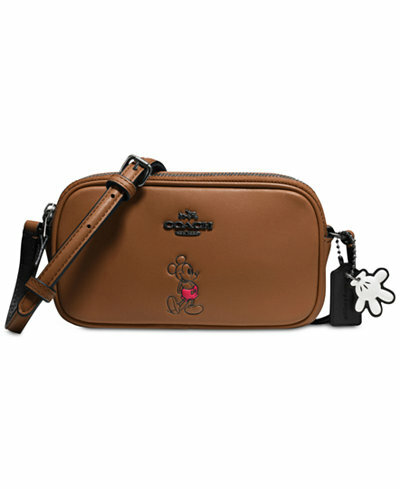 Whoever decided to place the iconic image of Mickey Mouse on the classic style of Coach bags in a variety of cool colors was a genius. 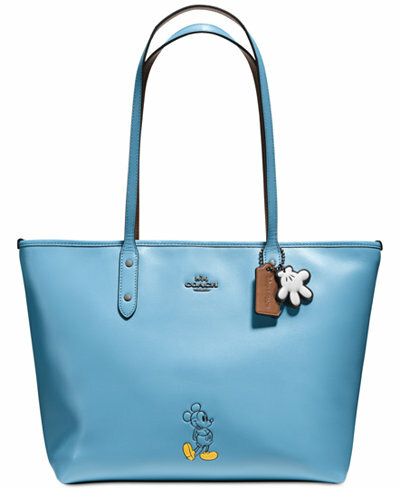 One of Disney’s most beloved illustrations of all time stars on this collectible, go-everywhere COACH tote crafted in beautifully rich calf leather and accented with tongue-in-chic hangtags. I’m partial to the BlueJay color – don’t you love how his yellow shoes stand out against the leather? See the bright berry color of Mickey’s shorts on the crossbody pictured above? You can also order the Mickey crossbody in that same color. And did you notice the Mickey hand hangtag? No detail has been missed in this line. 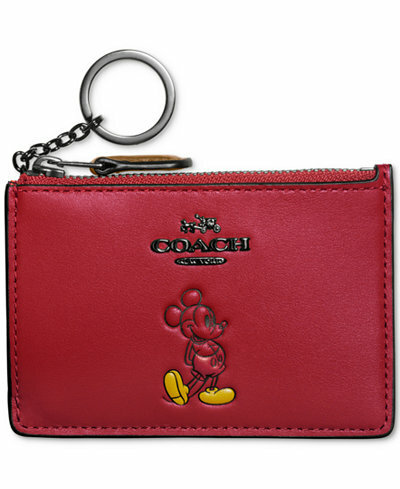 Who wouldn’t love the classic red associated with Mickey Mouse in this ID pouch? Of course, you can also find it in the Saddle & BlueJay colors shown above if you want to coordinate it with your matching bag. You may have noticed that the “Final Cost” is quite a bit lower than regular price. That’s because you save an extra 30% off the regular price of the Coach Mickey Mouse collection when you use code FRIEND during the Macy’s Friends & Family Sale. This pixie dust is real, but only for a limited time. Mickey would say “See ya real soon!” but I’m going to tell you to “Shop real soon!” if you want to bring this colection home with you this holiday season.